Many types of asbestos containing floor tiles are still around today. They were originally used because they were comparatively cheap, flexible and strong. For these reasons asbestos floor tiles were widely used in properties built from the early 1950s right through to the 1990s. 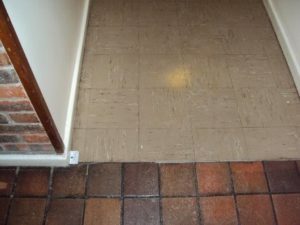 Usually the asbestos floor tiles were laid directly on to the floor screed of the ground floor of houses. In blocks of flats, where you have concrete floor slabs on every level, asbestos floor tiles were commonly used throughout the whole block including communal stairwells and lift lobbies. Often the asbestos floor tiles only come to light when a carpet or flooring is being changed. In our experience many carpet fitters either don’t know about the potential for asbestos in the floor tiles or choose to ignore it. This becomes an issue when the carpet fitter needs to install new gripper rods to the perimeter of the rooms. 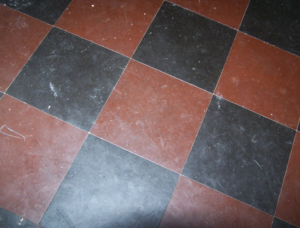 One of the most common types of asbestos floor tiles is the thermoplastic tile which is particularly brittle. When the fitter tries to nail gripper rods to thermoplastic floor tiles they will break up (shatter) very easily. Although the tiles will not release significant amounts of airborne asbestos fibre this approach is a long way from best practise. For many homeowners the first instinct when they learn they have asbestos floor tiles is to get them removed. Unfortunately, many asbestos floor tiles were stuck to the floor screed with a black bitumastic adhesive which in also contained asbestos. With the asbestos floor tiles removed what they are left with is a black sticky mess which still contains asbestos. In most cases you are better off leaving the asbestos floor tiles in place and overlaying with new flooring. Due to the nature of bitumastic adhesive the cost of removing it is often far greater than the cost of removing the floor tiles. The common types of asbestos floor tiles are detailed below. As detailed above, thermoplastic floor tiles can be very brittle. Whilst they remain well adhered to the floor and in one piece they will last for decades. They are usually adhered to the floor with a black asbestos containing adhesive. 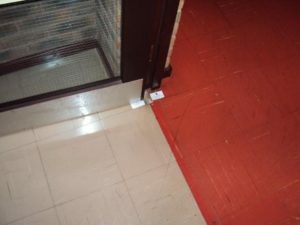 Thermoplastic floor tiles were very common in social housing built between the 1950s and 1980s. 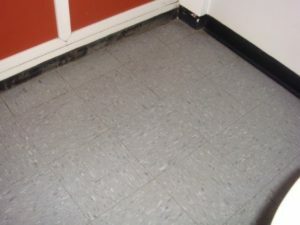 Thermoplastic floor tiles contain a relatively high asbestos content when compared to other asbestos floor tile types. Thermoplastic floor tiles usually contain chrysotile (white asbestos) but have been found to contain some of the less common types of asbestos such as tremolite and actinolite. Softer and more flexible than thermoplastic floor tiles the vinyl floor tiles are easy to confuse with the modern non-asbestos floor tile types. 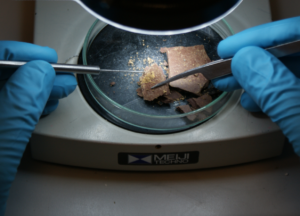 The only way to be certain about the asbestos content of any floor tile is to have them sampled and analysed by a UKAS accredited asbestos laboratory. Asbestos vinyl tiles contain predominantly white asbestos. Asbestos content in vinyl floor tiles is usually no more than 1%. Often used to replace damaged thermoplastic floor tiles which can lead to a mix of both types of floor tiles in a single room. When new vinyl tiles have been used as replacement you can end up with both asbestos and non-asbestos floor tiles side by side. 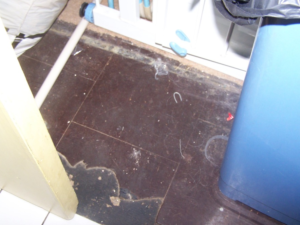 Typical images of asbestos vinyl floor tile are show below. Asbestos containing sheet flooring and linoleum is still being found during asbestos surveys. The most common asbestos occurrence with this type of flooring is an asbestos paper lining found on the underside of the flooring. Although the upper layer of the flooring can be asbestos free the backing layer can be up to 100% asbestos. Apart from the flooring types detailed above it is also possible to have yet another asbestos issue with your floors. Believe it or not, some types of floor screed can also contain asbestos. Usually red or pink in appearance these asbestos floor screeds contain a small amount of white asbestos. The asbestos floor screed is very low risk but needs to be identified so correct procedures can be adopted when undertaking work to repair or replace flooring. 1. Ensure that all the different types of floor tile are sampled in case you have a mixture of asbestos and non-asbestos floor tiles. 2. Check room perimeters, particularly around gripper rods as you may be able to pick up a loose piece instead of having to cut or snap off a new piece for analysis. 3. Always gently wet down any sample points, including the underside of the flooring just in case there is a layer of asbestos paper or adhesive concealed beneath. Our DIY asbestos testing kit is ideal for sampling asbestos floor tiles. For more information on sampling and analysing thermoplastic floor tiles, vinyl floor tiles, linoleum (and sheet flooring) and floor screed please contact us on 10923 661144 or use the contact form on this website.